June 1st. Enough patting ourselves on the back – time to get back to work! But what to work on? Cinnamon, Nemo? Something else? It’s a constant process of iterating over our projects, and gradually refining here, fixing there. The issues lists guide us to a certain degree, along with a set of long term goals laid out. But in between it’s often a matter of what catches our fancy – some days I’ll check out a problem someone is having, and decide I’m not stopping until I’ve fixed it – and there can be just as much a sense of satisfaction fixing that minute detail as there is implementing a slick new feature that everyone’s been clamoring for. I know (and I’ve read) that it can be frustrating to be experiencing a bug, and seemingly have that bug ignored for months and months. It’s never that we don’t care, or we think, ‘that’s not important.’ You have to understand, it’s 1000x easier to fix a bug when it can be reproduced – and that can often be difficult. Or an issue can be reproduced, but there’s just no obvious fix. There are a limited number of us – like any team, we have to optimize our efforts – if we spend an inordinate amount of time on one issue, other things suffer. In the few days since Mint 15 was released, I’ve noticed dozens of things I personally want to fix or address – will I get to them all? Only time will tell. Probably not, but it’s all about continuous improvement. That’s what’s so enjoyable about participating in development – there’s always something to do. I thought you guys deserved a break but you all are of the nature working_more_is_rest_for_me :-). Keep up the good work! Looks like, with this pace Mint 16 is not far away. Yes, without any shame, I am hijacking this thread and trolling! If you are looking for suggestions I’d like to propose a fix for Nemo: the option to rename a file/folder by clicking it twice (not double clicking, there needs to be a pause inbetween). This is a minor annoyance that I’ve had with every Linux filemanager I’ve used. Coming from Windows this still gets me more often than it should. You know you can rename any selected file by pressing F2? Just saying. Since you need to use the keyboard anyway, that’s even faster than clicking twice. If such a “feature” were to be implemented, please make it optional. Many people I know, myself included, absolutely hate that behavior. I remember my mother, back in the late 90’s when we had a shared pc with windows, used to trigger that twice-click-rename by accident without even noticing and rename random files. Very annoying. I know about F2, but on my laptop I have to press fn+F2 which just feels awkward. You are absolutely right in that this would have to be optional. Well, how about seeing what you can do as for fixing problems with graphics drivers and support? At the time of posting this the only way I can boot into the Cinnamon 64 bit of LM15 is using software rendering. I think the fallback worked too once. I’ve seen several posts about this on the forums with both ATI/AMD and NVIDIA graphics. I Haven’t got a disk of 14 handy to test if it’s still got that problem- may burn one soon but I’ll have to redownload it. I’m using the DVI output of a Radeon HD 6570 by the way. PS: If these problems aren’t Mint’s fault, could you try to fix them anyway? I haven’t got a clue what to do. PPS: Sorry if this is badly structured and does not give enough info. I like this blog and the post in it. I shamelessly report it here, because it might help you or someone: please add ‘sudo nvidia-xconfig’ to the new Driver Manager as a final step of installing an NVidia driver! The lack of this has broke my LM15. Thanks in advance! When I started using Cinnamon I produced a ‘wishlist’ of improvements and the latest versions has covered most of those already. It seems rather churlish to ask for more when you have done such a superb job but you have asked for suggestions so here are the remaining items. 1. A file previewer integrated into Nemo like Sushi was with Nautilus or one based on Globus. 2. A really good Network Traffic Monitor applet for mobile operations – there are several available but none are perfect and the favoured applet the Network Speed Monitor does not currently work with bluetooth connections or Mobile Broadband USB sticks and development has been discontinued. I have modified it sufficiently for my use and will upload after further testing but I believe it is suffiiciently important to mobile users that it should be one of the system maintained Applets. In addition there is the issue of Documentation and Tutorials – I know there has been a lot of discussion already and the proof of the current approach is with us, however please keep the tutorials etc coming as there is still a tremendous learning curve to climb before new (or old) blood can start to contribute. Now with Olivia being VSTS (Very Short Term Support! ), it seems that many are concerned with having to upgrade in a few months: it would be great if there was a way to upgrade that is both safe and simple and that let’s you end up with a fresh install and your previous settings. A friendly install program that guides you through backing up your files, settings and packages, installs the new system and copies back your files, settings and extra software, all from a live session would be just revolutionary. Am I crazy? Should the team spend the time and money on something most users can handle or on something most users can *not* handle ? It’s been not rolling (I think I got the grammar right……or maybe not) because Debian’s been freezing the Testing edition. Now that it’s rolling again, the next update to LMDE should include newer things, removing the need for the thing you’ve proposed. Or perhaps I’ve managed to miss something. The comment from Hugo Masse has reminded me of another suggestion which goes part way to what he is suggesting – that is to have a separate home partition as part of the default install. That makes a reinstall much easier and also makes backing up ones files and settings almost trivial. Add the generation of a list of programs which are installed and one is almost there – I have a script which installs all my standard programs on any machine where I do a reinstall which only leaves hand crafting a few system files. The idea is far from crazy. and would make a big difference especially if it allowed the conversion from Ubuntu to Mint. I used to put /home in a separate partition too; thought it made upgrades easier. However I realised it often happened when I install a new distro and use an existing ~ folder, several bugs turn out with the user settings, login, DE, etc. I tried using different usernames but I found that annoying. Now I keep the whole OS in a single partition, including the /home folder. I have two partitions dedicated to gnu/linux distributions so when I install a new one I can test it before migrating completely. When I do so, the “old” distribution’s partition will serve to install the next one. I find this method more failproof because I can always go back to the previous OS which I know works. Also, it makes it easy to migrate the applications and DE settings: I just copy some of the .settings folders from the older partition. On last thing, I keep my Documents, Pictures, Music and Videos are in a separate, NTFS partition which allows me to easily access my files between Windows and the different gnu/linux upgrades. When I install a new distribution, I replace the Documents, Pictures, Music and Videos folders by shortcuts to the data folders in the separate partition. Does anyone know if that happens when you backup your home directory? Do you copy all the hidden files and folders, risking the buggy situation described above? So, best option for upgrading so far would be the one Geoff mentions: a separate DATA partition (not home partition) and at least a couple of partition for a smooth transition between distros or versions. Can that be automatized? Merci, Geoff. Question for you, Geoff: What’s your policy on grub location? Do you always control grub from your latest install or do you not install at all or place it where it’s harmless (sda2 or something like that), and update from the previous install? 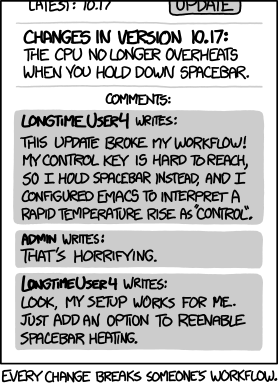 What happens if you decide to stick to the latest install? Actually, Quaturna, I was thinking about former Ubuntu users fed up with Unity or Amazon ads who are looking at Mint as an option but who are having second thoughts because there is no upgrade-to-newer-version button. I’ve read reviews where they present this as a disadvantage. If there was a way to cater for those users (by promoting regular backing up rather than doing stuff for them), that objection would not be. If we have Image Writer that automatizes the dd command, why not something to make upgrading less painful for those who don’t feel ready to back up files and extra packages, perform a fresh install and restore said backups? I need to think this through and if I come up with something useful, I’ll put in black and white. P.S. The same applies to windows users who dislike windows 8. LMDE is rolling release, Debian based. But ironically, it is far behind classical Linux Mint (Ubuntu based) in terms of package freshness. Maybe it would be smarter (although probably not as easy) to not spend time in this classical Linux Mint upgrade thing, and focus on making LMDE really rock ? Simply because Debian Wheezy was frozen. It’s been released now, so the world of Debian (and therefore LMDE as soon as the next upgrade pack arrives) should finally orbit the Sun again. The packages in LMDE are old because the packages in Debian were. Whenever (e.g. security-) updates arrived in Debian Testing, they arrived in LMDE months later! This is an unacceptable state, mainly for simple security reasons. The trivial fix is to replace the silly Update Pack repositories by the default Testing ones, in sources.list. Well, VolMi, if you do that, you’d end up having, instead of LMDE, DGLME: Debian GNU/Linux, Mint Edition i.e. Debian Jessie with LM tweaking on top. Mind you, so far LMDE is based on what now is stable (Wheezy) so that may be a very risky approach. Good luck with that. If everybody were going to ignore the UPs maybe the dev Team would be able to do other stuff… but I think the UP approach is fine if you want a super reliable OS, it just adds an extra security layer after Debian does theirs, if only for the time between their release and LMDE’s, when things that can go wrong would be detected and fixed. This is closer to CentOS reliability, right? Aren’t they still running on Gnome 2? If you want Mint AND newer stuff, go for the 6-month release. If you want stuff running in your OS as soon as it is released, maybe try another distro (Fedora? Arch?). 1) apt. I love it, I’m used to it, I want it like I want my girlfriend. Okay, ubuntu has it, but Arch/Fedora are not a real option for me. sudo apt-get install occult-package without having to think much about it. There’s actually some software I use on Debian which is not simply available in ubuntu. I can’t name it now, bacause I simply forgot about it. 3) An enormously large and expert community. I’m never the first one to find an issue. If I do have issues I cannot solve, a solution or workaround is always found in the intertubes. Plus, there is less noise from Linux beginners. 4) Stability. Debian Testing is actually very stable in comparison with distributions which do not answer to the name of Debian Stable. Actually, the idea with the update packs is not bad, for being able to (almost) guarantee an always working system. But I find its current incarnation horrible due to lack of support. If issues occur with DGLME¹, e.g. the upcoming transition to Gnome 3.8 in Testing, which will probably break Cinnamon 1.8, there is still apt-pinning, so I can use all Gnome stuff from Debian stable for a while. In my ideal world VLW (“VolMi Linux wonderland”) LMDE would import Testing packages once a week (meaning every 7 days quite strictly, not 7-40 days or so…) if they would not break the OS. Packages that were found to break LMDE were eventually imported from stable (so we would still have security fixes). In the real world, things are actually pretty similar to VLW, but the delays are way too long for me to be happy, by a factor of roughly 20. Remember, an up-to-date LMDE, which is based on Debian Testing, is actually significantly older than Debian Stable and all the bugs fixed in the last weeks before Wheezy was released, are not fixed in LMDE. One very simple element of an LMDE policy would be: If a Debian release is finally becoming stable, just merge all packages. ¹ :-) I like it. Besides all that, if you want something new, for example, the Skype newest release, you can always get the .deb file to install it, in most cases, if there’s a linux version, that will be .deb. I’ve tried my hand at Arch but I’m not ready to enjoy having my install break after an upgrade and smile as I roll up my sleeves to fix it! Have you posted this idea in the linuxmint community? If they need testers I’m sure there will be a big bunch around! Cinnamon usually starts in black. Sometimes many characters are missing. Bart: I never saw that, as a n00b that I am, I’d reinstall. Or ask about this in the forum. Many thanks for your excellent work! Mint 15 is the best so far because you paid attention to the small details that you have been ignoring for a long time like boot animation and MDM themes. Believe me design is the most thing that attracts users. A well polished OS would give a good impression about the developers and about the OS itself. “Hey that’s a well cared for OS” that’s what people would think. Zorin OS had done a great job on that but it is still behind Mint in terms of stability and in terms of elegance when compared to Mint 15. Please pay more attention to theming. Themes would make a user experience with the OS more confortable. cheers!! Okay.. Im not a code monkey, but what Hugo mentioned in his first post made me think about something we do not yet know in linux, or i have not come to the part where i can find it. I know linux makes it very easy to reinstall my pc, as it takes me a third of the time, but.. That does not help me with upgrades. the tool i am looking for is a way to have the ” package tool” or your friendly installer if you prefer to name it that way, safe all used packages to an account, for example email like Android (linux right) does. I know this will not work all the time and might provide conflicts that linux wants to warn us about, but do you think a tool like that is possible in Mint? There you can record which packages are currently installed and when you restore it, the missing packages get installed with one clic, is that what you meant? Comes close, but not exactly what i had in mind. Although the backup tool backups your repositiries, it doesnt upgrade them on your fresh install. And i dont like doing things twice so i would suggest verifying the backed up distro`s with the new ones to see if upgrades are available before installing. .
Just got a chromebook pixel, yay for amazing friends because I could never have afforded one. So my request would be support for all the wonderful things that pixel brings to the table. Good touch support and hiDPI screen support. Thanks for Cinnamon, I come from Ubuntu (Mac like) Unity so, I am much happier with Mint. For me, a must have in any desktop is Show Desktop and a good Screen Shot program, which Cinnamon has. In Nemo, I would like to see an option to always start in Duel Panel mode, in stead of F3 manual start. The only minor thing that irks me about the current (1.8.x) version of cinnamon is the date time settings. There needs to be a top-down, universal setting for the whole system. Right now, by default MDM is 12 hour, the panel is 24 hour, and the lock screen is 24 hour. The panel format is easy enough to change, but the MDM one is not (luckily, I prefer 12 hour, so that isn’t an issue.) The lock screen time however, is not configurable at all. Will this be addressed by mint 16?